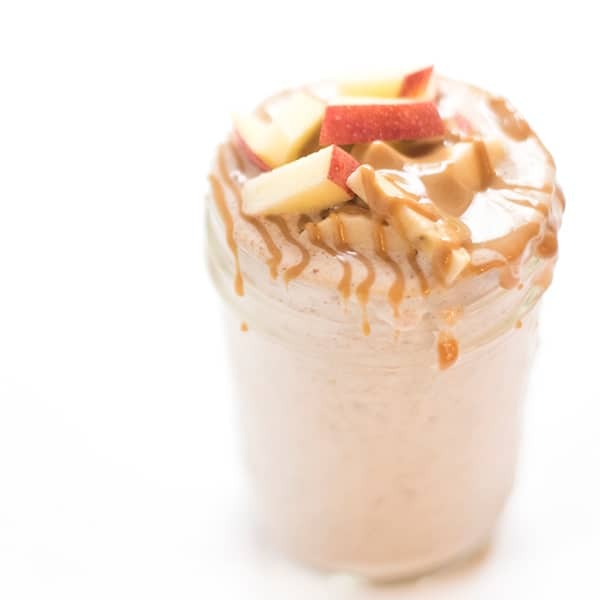 Creamy, natural peanut butter and crisp, juicy apples are the perfect natural sweetener for overnight steel cut oats. Apple season continues here in Michigan and to celebrate, we recently picked up a big bag of crisp gala apples from a local orchard. Is there anything worse than a mealy apple? I vote no. 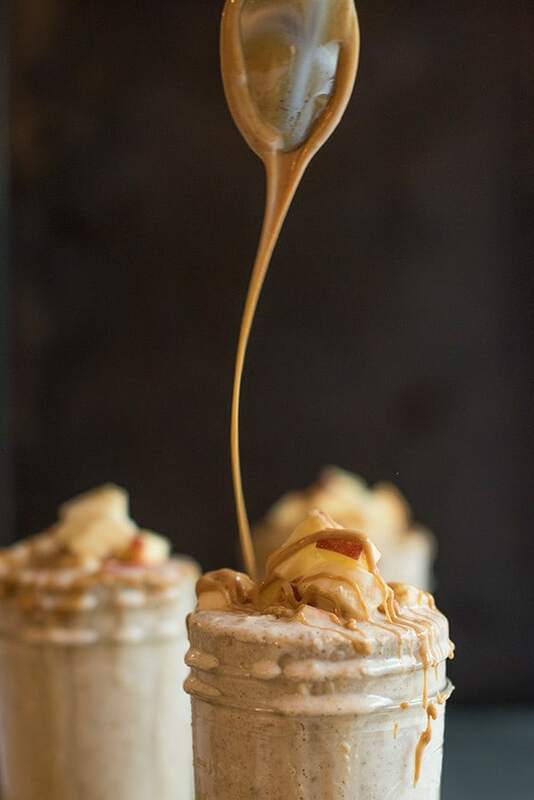 Truth be told: I love a fresh apple but a fresh apple mixed with creamy natural peanut butter? Yes, please. All of my friends know that I am mildly obsessed with Koeze natural peanut butter. Not only is it roasted locally here in Grand Rapids but it comes in the most adorable glass jar. 2. 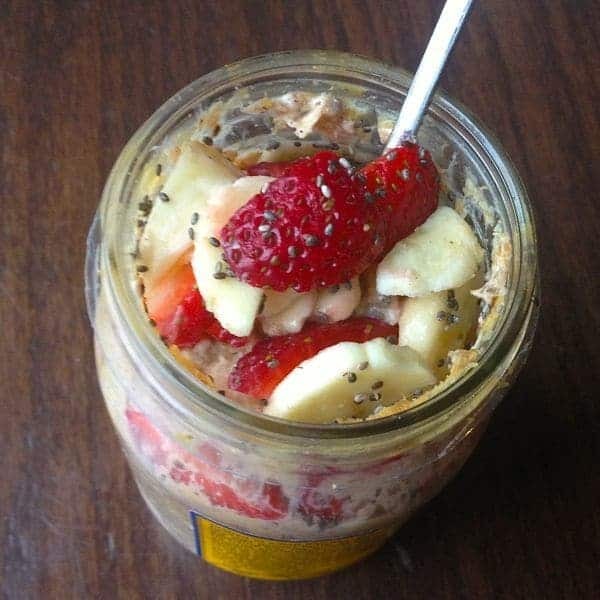 When the peanut butter is almost gone, the jar instantly becomes a re-sealable container for overnight oats. If you love the idea of making breakfast the evening before but don’t love the idea of cold oats, simply pop the jar in the microwave and a warm breakfast will be ready in 30 seconds. 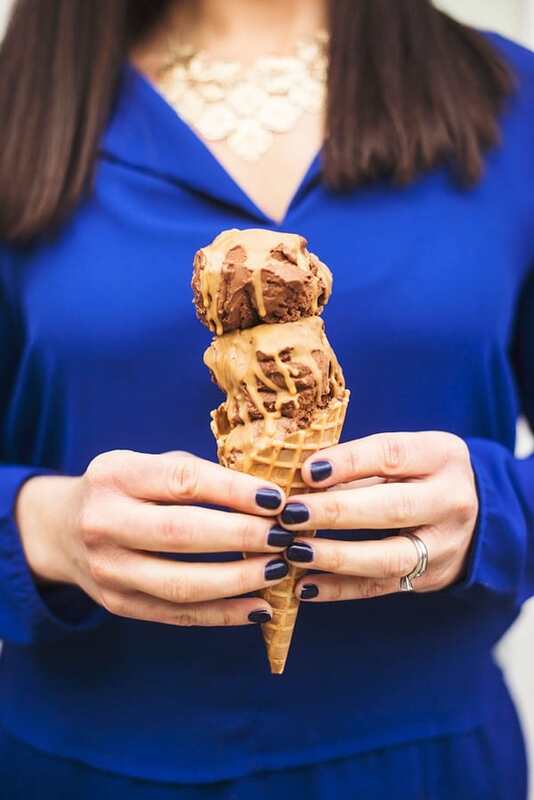 Your fork spoon is waiting. 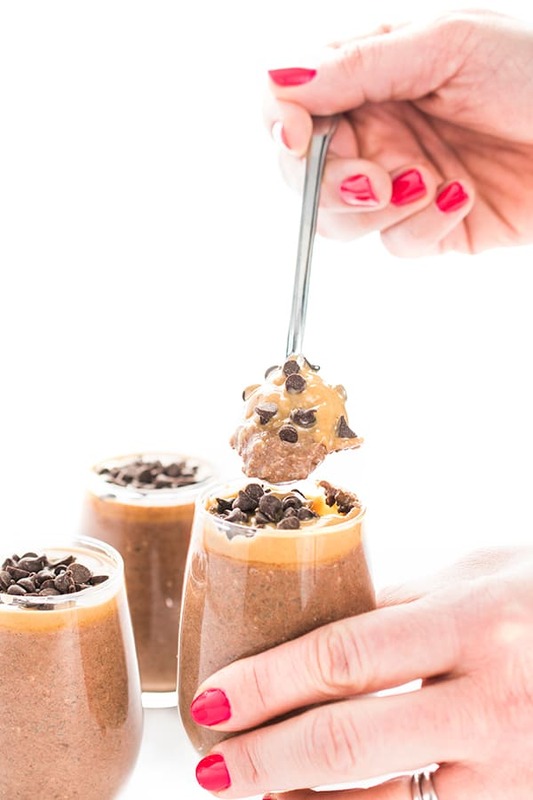 In an almost-empty peanut butter jar or another resealable glass jar, combine all ingredients except banana and apples. Seal jar and refrigerate overnight. Top with banana slices and diced apple in the morning. Serve cold, room temp or pop in the microwave for 30 seconds to warm. Steel cuts will have a nice chew to them but if you prefer to cook them further, add 1/4 c extra milk and microwave for 90 seconds. These are hands down the worst overnight oats I have ever had. I’ve tried a million recipes. There is too much liquid, not much flavor, and a ton of calories. Maybe peanut butter would help or chia seeds maybe less milk. I don’t know. I meant to write peanut butter powder. I used natural peanut butter. I made these oats exactly to your recipe. I made no substitutions. Hope that clears up your confusion. I’m not sure how you are going to help me make overnight oats correctly. It’s a bunch of ingredients in a jar; either those ingredients work together or they don’t. I don’t write reviews to offend the author. I write reviews to help other people in search of great recipes understand if this is a good choice for them or not. These oats are not flavorful, they are thin, they are calorie dense. Thanks again for writing and have a great day! I, too, am wondering if Old Fashioned Oats will work in place of the Steel Cut? Will any of the measurements change if using the Old Fashioned? Absolutely! Any kind of oats will work! No need to change measurements. :) Enjoy! Is it possible to freeze these so that I can make them in bulk and then have them for a week or 2 to thaw & have in the morning? I wouldn’t recommend freezing them but you can make it on a Sunday in a big bowl and scoop it out for several days! I dont have steel cut oats. will ‘old-fashioned oats work? thanks! im excited to try this! can this be done with almond milk and almond yogurt? I assume it’s simply the liquid that helps ‘cook’ the oats overnight? i may just have to try! Absolutely!! You got it – the liquid basically softens (aka cooks) the oats so that it’s easy to eat. I like mine on the chewier side but some people like their oats a bit more mushy and add more liquid. Totally up to you! Enjoy! YUM!! This looks amazing Liz! Great way to use those michigan apples! 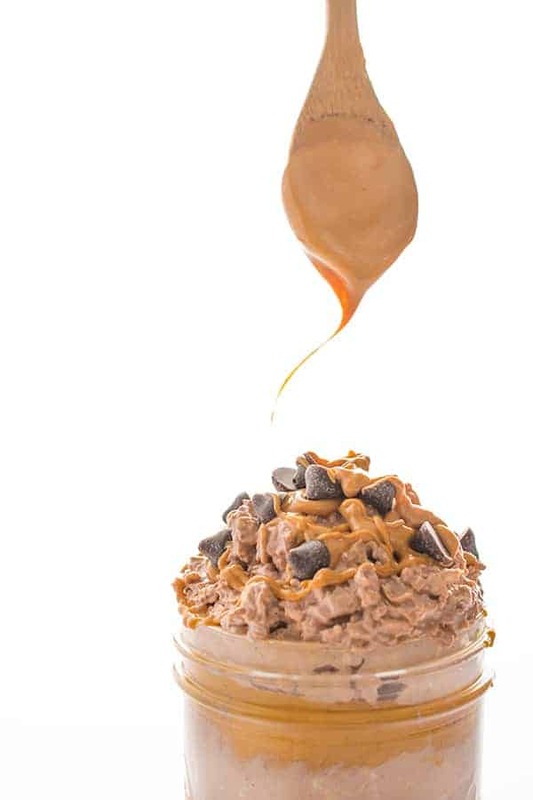 This looks like a great way to change up my usual PB and banana. And I love the overnight idea. Totally- add whatever you have around! Let me know what you think! I totally need that this morning. My little bowl of Special K just isn’t cutting it. It’s definitely filling – nothing worse than being hungry an hour after you eat. :-) Let me know if you give it a try! That sounds awesome! I have just finally started eating oatmeal for breakfast after years of wanting to but not enjoying it. My new go-to is 1/2 almond milk and 1/2 water with a pinch of salt, cinnamon, vanilla extract and a teaspoon of each raisins and maple syrup. 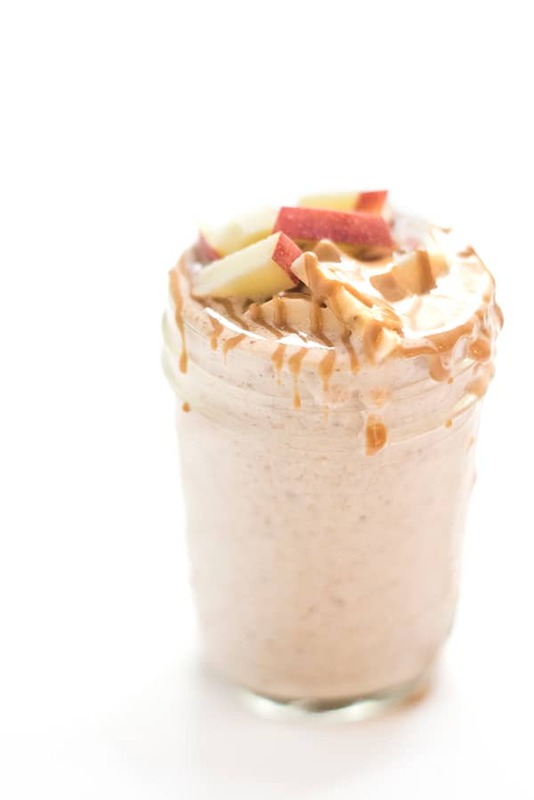 I eat PB and apples as a snack almost everyday so this is right up my alley – I have to try it! I have never made OO with steel cut oats! I didn’t think it would work. Must TRY! It definitely works!!! I actually love using steel cuts for overnight oats since normally it would take 20 minutes! Enjoy! !